This article builds on the techniques learned in "Good, Better, and Best: Converting and Managing Local Coordinates in a Projected System," which ran in the Spring 2013 issue of ArcUser magazine. Download the sample dataset and unzip it locally. The grid origin is essential. Our surveyors just returned from the field with very carefully derived longitude and latitude in World Geodetic System 1984 (WGS84) for the collar of DHA-78-001. 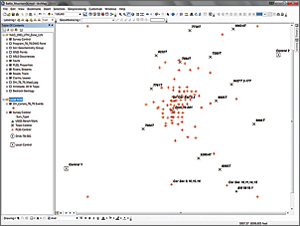 This information should be sufficient to define a coordinate system for the Local Grid data frame. 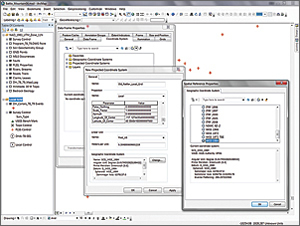 Once it is created and tested, this local coordinate system can be saved to the Favorites in the list of ArcMap's projections so it can be used to register other early project data including the Program_78_79 CAD drawing. 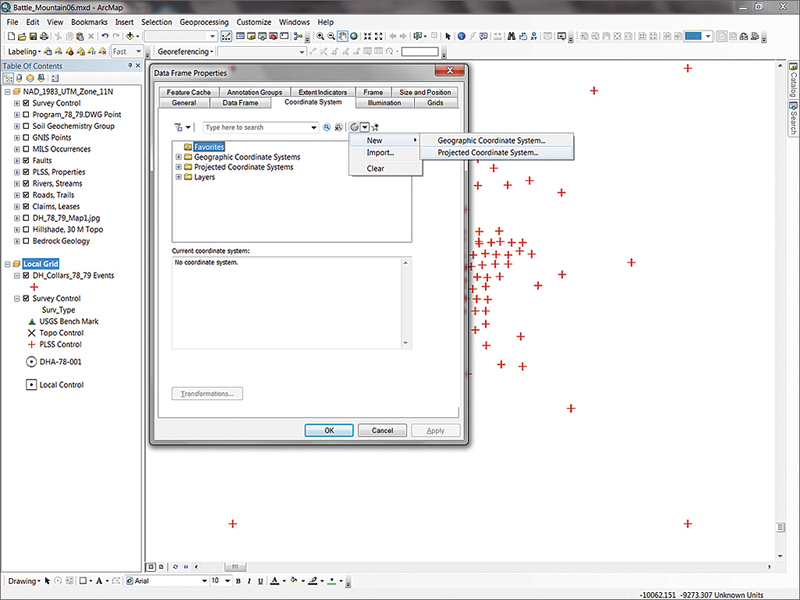 Open Properties for the Local Grid data frame and select the Coordinate System tab. Mouse over the small icons to the right of the search window to locate the Add Coordinate System icon and click its drop-down arrow. Choose New > Projected Coordinate System. Name the new coordinate system Old_Rattler_Local_Grid. Change the Projection Name to Local. Now fill in some of the blanks. Scroll down past False_Easting and False_Northing and type in the values in Table 1 for some other parameters. Our surveyors collected very precise WGS84 geographic coordinates for the origin drill hole, DHA-78-001. Longitude and latitude values are necessarily very precise, representing centimeter-level measurements. Check them carefully as you enter these values. 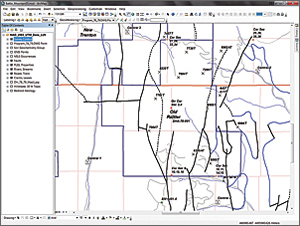 Set Linear Unit to Foot_US and change the Geographic Coordinate System to GCS_WGS_1984. Click OK twice to update the Local Grid coordinate system. The Tranformations warning box appears. Click Yes (Remember, never check the box next to Don't warn me again ever). Click OK twice. Return to the Coordinate tab and click the Transformations button. 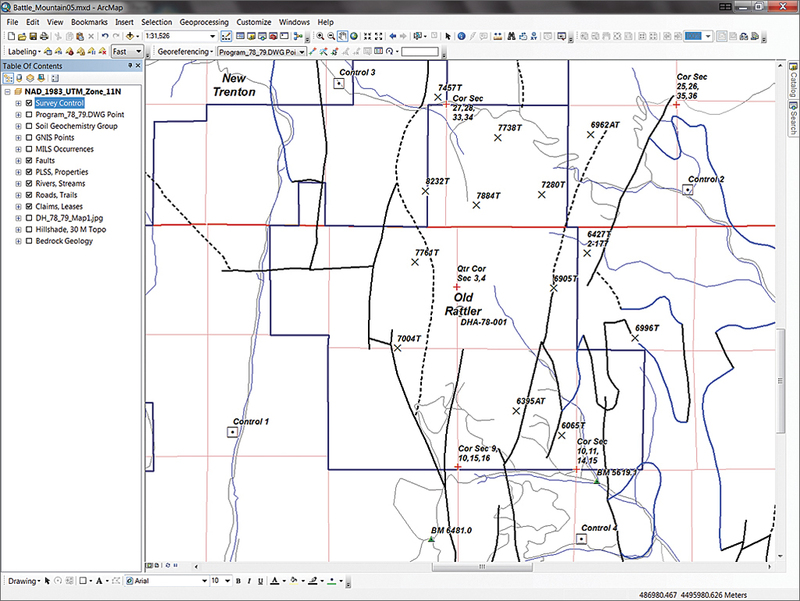 In the Geographic Coordinate Systems Tranformation dialog box, set Convert from: to GCS_North_American_1983; set Into: as CGS_WGS_1984, and set Using: to NAD_1983_To_WGS_1984_5. This is a very important step. 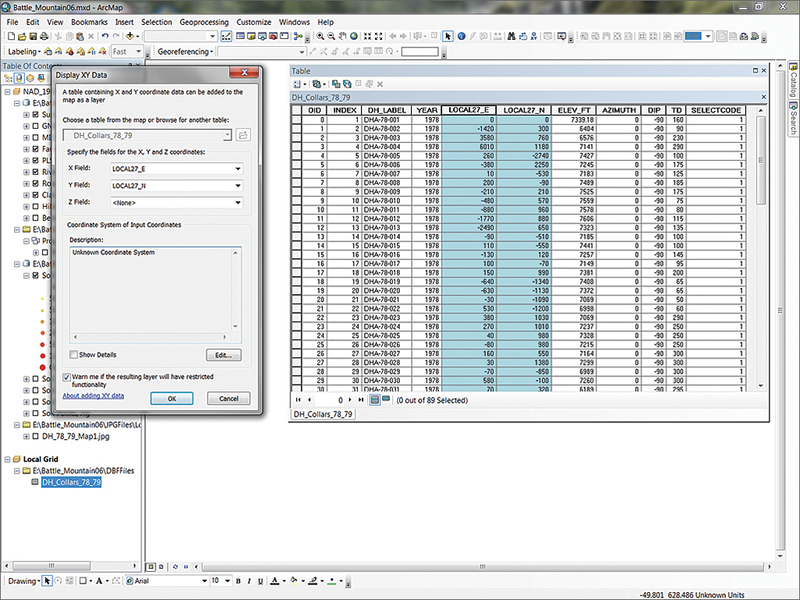 Click OK to close Data Frame Properties and apply the update. 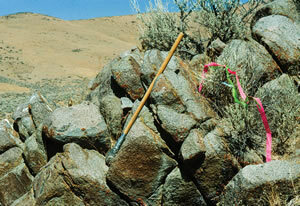 Zoom to the layer extent and see how well the control points on the drill collars data matches Survey Control points. Zoom to the DHA-78-001 (the origin that is labeled) and check its coordinates. They should be very close to (but perhaps not exactly) 0,0. If you have a difference of more than a foot, return to the data frame's Coordinate System properties and check the values entered for the longitude and latitude center coordinates. Save the project. Notice that four red crosshairs in the display's corners are still orthogonal (i.e., not rotated). This will be fixed interactively in a later step. Zoom back to the extent of the Survey Control layer and save the project. With the origin pinned, we are on our way to defining a local coordinate system. After defining the origin, we can focus on the grid's rotated azimuth. Return to Coordinate System properties and set Azimuth to 16.8. Apply the change and study the difference. Now the collar control point falls about 20 feet northwest of Control 2. Split the difference and try an azimuth of 16.9 degrees. Reset the azimuth and check the results. This time, zoom way in to Control 1 and measure. The collar control should be only a foot or so from Control 1. Notice that the collar point is directly northeast of Control 1, located southwest of the grid's origin. Let's fine-tune our coordinate system next. Save the project. 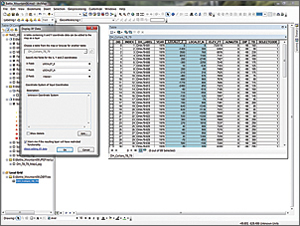 Right-click the DH_Collars_78_79 Events layer in the Local Grid data frame and choose Data > Export Data. 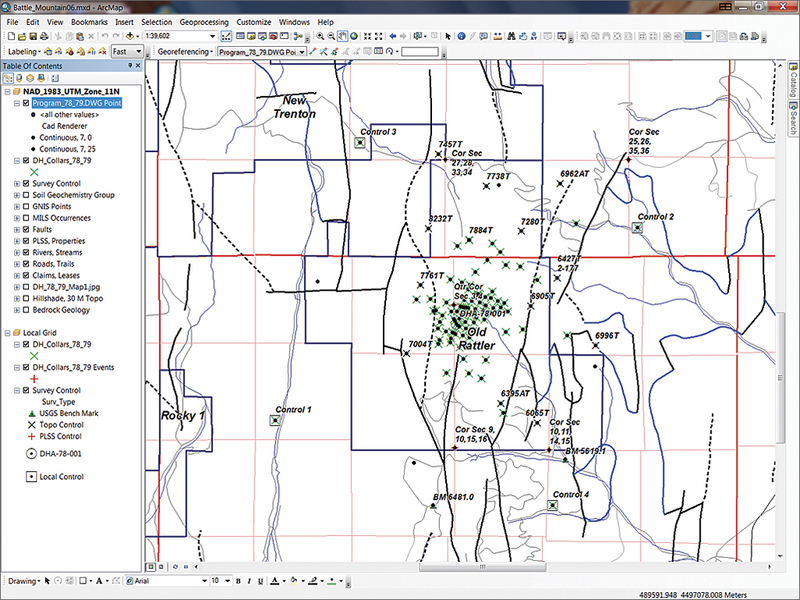 Save the shapefile in \SHPFiles\Local as DH_Collars_78_79 and click Yes when asked if you want to add this layer to the project and use the coordinate system of the data frame. Change the symbol to a green X and zoom to the map extent. Now for the real test. 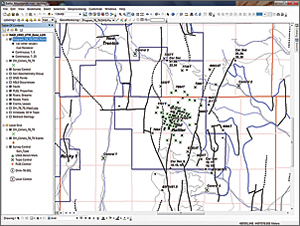 Copy the DH_Collars_78_79 shapefile layer in Local Grid and paste it into the NAD_1983_UTM_Zone_11N data frame. Make the NAD_1983_UTM_11N data frame active and zoom to the extent of the DH_Collars_78_79 layer. Carefully study the map. 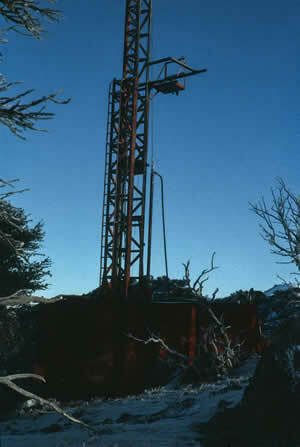 Notice the properly rotated control points match the origin drill holes. Save the project. Before applying the Old Rattler coordinate system to the Program_78_79.DWG Point data, a little "housecleaning" is needed. 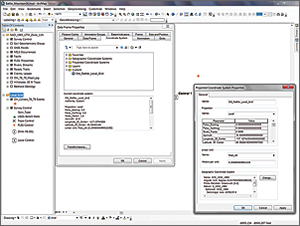 The two-point CAD world file previously used to register the Program_78_79.DWG Point file should be removed from the project and any reference to this earlier relationship erased. 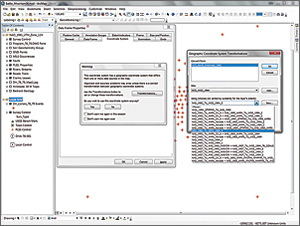 The best way to do this is to first remove Program_78_79.DWG Point from the UTM data frame, save the project, and close ArcMap. Open Windows Explorer or another file manager and navigate to \Battle_Mountain06\CADFiles\Local and delete all files under Program_78_79.DWG except Program_78_79.DWG.Points (including the .lyr, .xml, and especially the .wld files). Restart ArcMap and reopen the project. 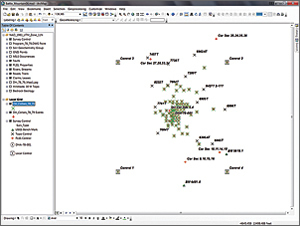 In ArcMap, open the ArcCatalog window, navigate to \CADFiles\Local, and locate Program_78_79.DWG.Points. 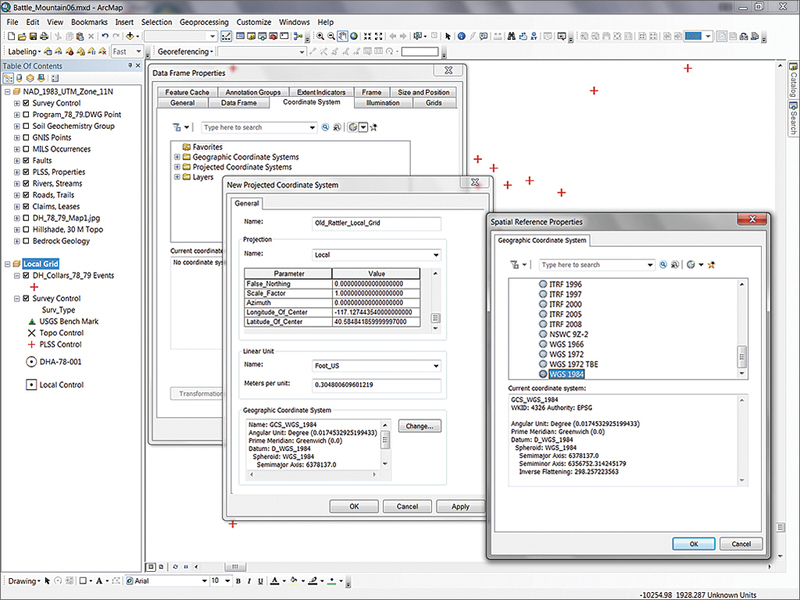 Right-click the CAD file and select properties. 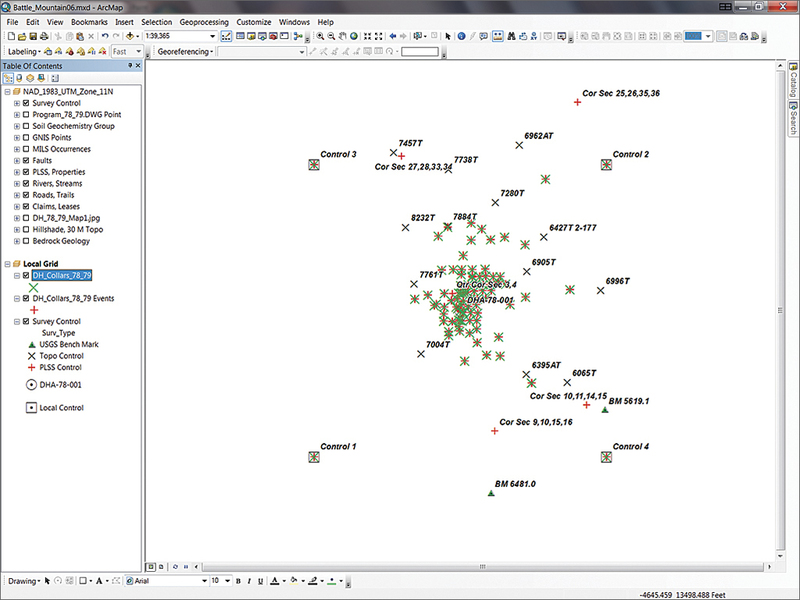 Open the General tab and notice that the Spatial Reference is undefined. Click the Edit button and select Old_Rattler_Local Grid from Favorites. Click OK several times to assign this coordinate system. Open Properties for Program_78_79.DWG Points to verify that the coordinate system has been applied. 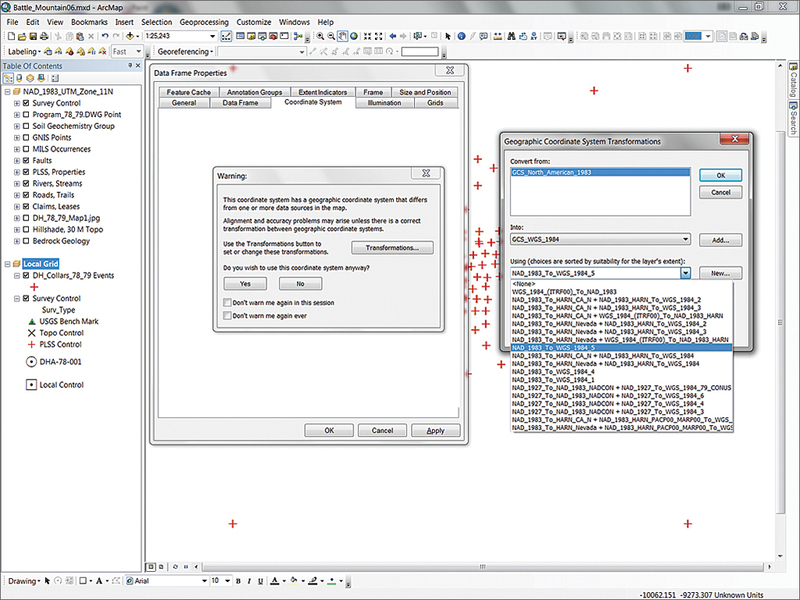 To test this CAD projection, drag just Program_78_79.DWG Points to the ArcMap canvas. These points should post right on top of the DH_Collars_78_79 points. 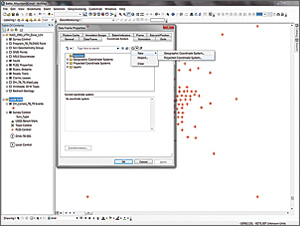 In the background, you created a standard Esri projection file that is located in the same folder. 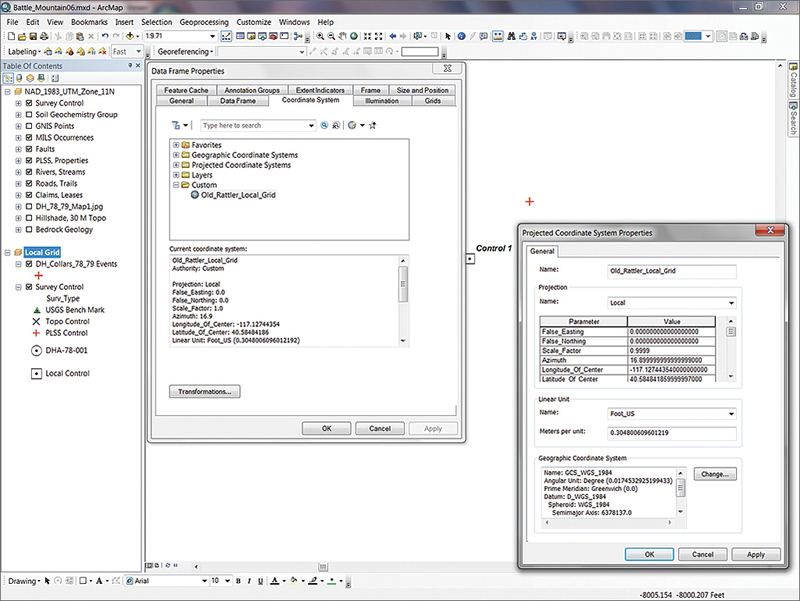 It has the same root name as the CAD drawing and a .prj extension. 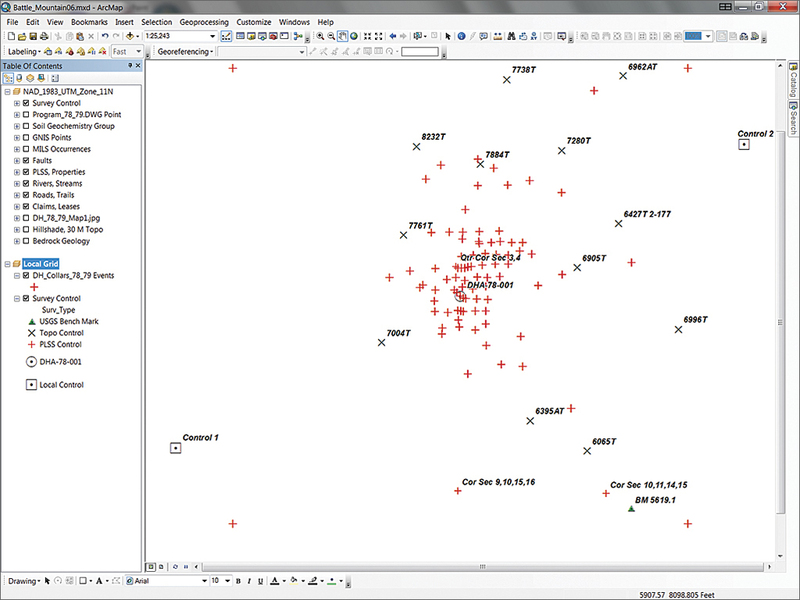 This tutorial actually uses the same steps covered in the previous article "Good, Better, and Best: Converting and Managing Local Coordinates in a Projected System," in the Spring 2013 issue of ArcUser magazine, but this time these steps were performed in a different order to define a local coordinate system in a new data frame.